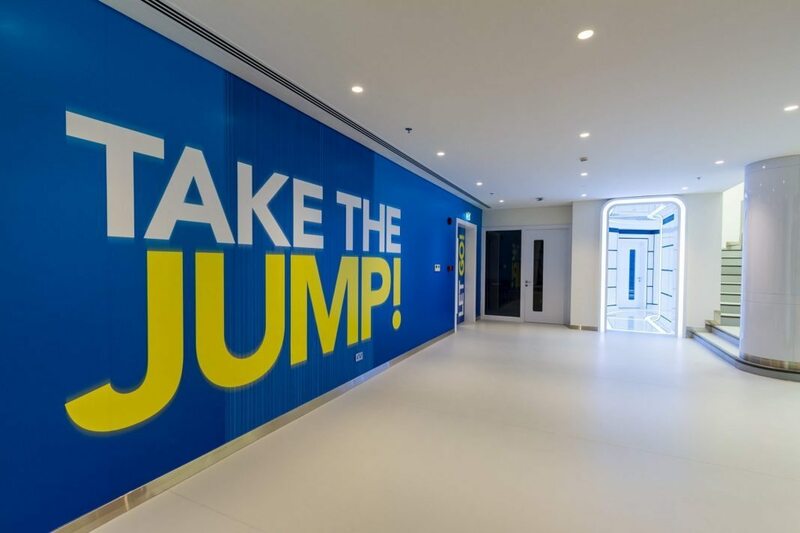 As part of its remarkable efforts to support tourism, sports and the economy in Bahrain, Samhaan Holding Company announced the launch of the “Gravity” project by the opening of the world’s tallest indoor skydiving tunnel made of 12 meters of tempered glass. 16 December, 2015 was selected for the official opening of the project by Samhaan Holding to coincide with and mark the celebration of Bahrain’s National Day and Accession Day. “Gravity” held a press conference on Saturday at its premises in Al Wasmiya near the Bahrain International Circuit, in which Mr. Mitchell Lawson, General Manager and Ms. Zoe Edwards, Commercial and Marketing Manager addressed the local, regional and foreign press. At the beginning of the press briefing, Mr. Lawson welcomed the attendees, expressing thanks and appreciation to His Royal Highness Prince Khalifa bin Salman Al Khalifa, Prime Minister to the Kingdom of Bahrain for the support and backing of this national project that is an initiative by the Chairman of Samhaan Holding Company, Shaikh Mohammed bin Rashid Al Khalifa to achieve this wonderful and first of its kind project in Bahrain to provide more entertainment and thrill to youth, Bahraini and Gulf families, residents and visitors of the Kingdom. After that Ms. Edwards talked about the main points about “Gravity” and a marketing plan that includes cooperation with all public and private organisations through providing packages with suitable prices. She said that the name and logo were selected after long thought as the tunnel has zero gravity and the symbol – The Hand Logo is derived from a hand gesture used by skydivers to communicate “relax – let go”. It is emblematic of the chilled out spirit of family fun that Gravity embodies. She said that outside the tunnel Gravity merchandise shop will sell everything related to the brand. The thrill of flying permeates every part of the experience including the elements on offer outside the wind tunnel, including conference room, briefing rooms, multipurpose room, Gravity café and fantastic IT facilities.